Polymeric foam and wool felt insulation warms this Knee Boot made of natural hand-crafted ozone-resistant rubber. 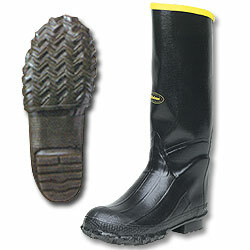 Knee Boot feature tractor tread outsole, full ankle design, ribbed vamp and steel shank in the arch for support. Wt. 6.5 lbs. 16" high.